Much of Heade’s popularity derives from his paintings of salt flats on the East Coast of the United States. Like other works from this series, The Marshes at Rhode Island occupies a transitional position between the virgin landscapes of the Hudson River School and the pastoral views. The present scene is no longer an untamed wilderness and suggests man’s intervention. In contrast to artists such as Jules Breton and Jean-François Millet, however, human presence is a silent one. It consists of little more than a half-filled hay wagon, a rake and some abandoned pieces of clothing, all indicating that the working day is over. Heade counterbalances the arrangement of the hayricks that recede into depth with the horizontal flow of the water in the foreground. The most striking element of the work is, however, the luminosity of the sky, which Heade studied under all weather conditions. 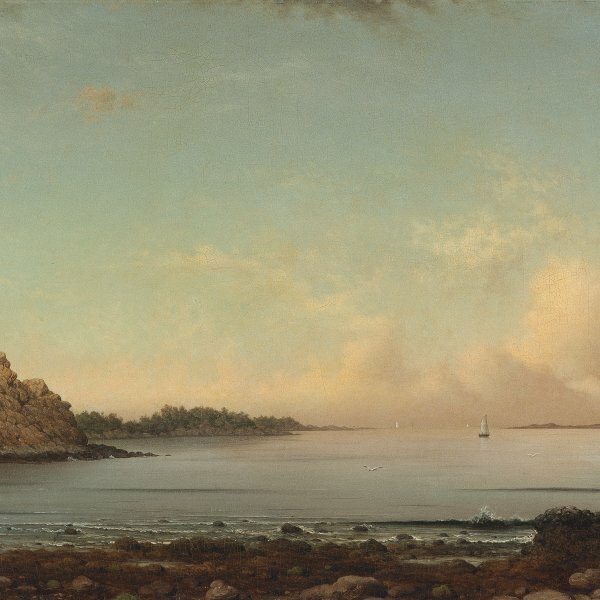 Martin Johnson Heade was always closely identified with the salt marshes of Eastern United States. James Jackson Jarves, writing in 1864, saw the meadows as his speciality. Heade painted their "wearisome horizontal lines and perspective, with a profuse supply of the hay-ricks to vary the monotony of flatness, but flooded with rich sun-glow and sense of summer warmth"; three years later Henry T. Tuckerman echoed Jarves' words, as he praised how Heade "especially succeeds in representing marsh-lands, with hay-ricks, and the peculiar atmospheric effects thereof." Heade was aware of the delicate beauty of the salt marshes, with their display of changing light. In Harriet Spofford's description of Newburyport which appeared in Harper's Monthly Magazine in 1875, she wrote: "he who desires to see a meadow in perfection, full of emerald and golden tints and claret shadows, withdrawing into distance till lost in the sparkle of the sea, must seek it here, where Heade found material for his dainty marsh and meadow views [...]." The demand was so great for Heade's paintings of the marsh and he was so successful, that C. E. Clement and L. Hutton wrote in 1879, that "he has probably painted more of them than any of other class of subject". Over one hundred of Heade's marsh paintings survive today, the finest painted in the late 1860s. The gathering of the salt hay, which grew naturally along the flooded coastal areas of the United States, required a community of labourers -mowers, rakers, stackers- during the time of its harvest. Although early in his career Heade painted genre and allegorical subjects, he chose to follow neither his European counterparts, Jules Breton and Jean-François Millet, nor such later Americans as Eastman Johnson or Winslow Homer in depicting the human activity during the gathering of the hay. Instead, Heade's paintings, for the most part, are scenes devoid of signs of active labour; like Claude Monet, who also chose to portray uninhabited landscapes displaying the labours of harvest in the 1890s, his haystacks are elegiac responses to the evanescent conditions of light, atmosphere and seasonal changes. 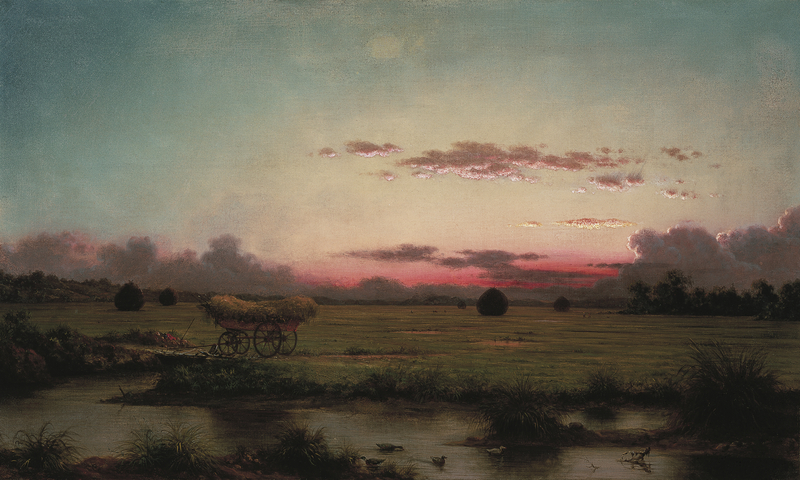 The Marshes at Rhode Island is larger than most of Heade's marsh scenes, and the haywagon, a motif he often used, is a more prominent part of the landscape. The wagon, partially loaded with hay, rests on the firm ground above the tidal marsh; before it protruding from a pile of rocks is the handle of a rake left by the departed harvesters. Stretching over the marshy ground to the horizon are haystacks. Hay was carried by horse and wagon or boated from the marsh during high tide at the time of harvest; but endless rows of haystacks were also left in the marshes until winter, when the ground was frozen and the hay could more easily be retrieved. The haycart, silhouetted against the twilight, suggests the transitory nature of man's labour, a poignancy underscored in Jersey Meadows, with Ruins of a Haycart (c. 1881, formerly New York, The Metropolitan Museum of Art) which shows the vestiges of a decrepit wagon abandoned among the stacks of hay.